This article focuses on our current understanding of the role of activated coagulation factor VII (FVIIa) in coagulation, the current evidence regarding the efficacy and safety of recombinant FVIIa (rFVIIa), and thoughts regarding the use of rFVIIa in spine surgery. rFVIIa is approved in many countries (including the European Union and the USA) for patients with hemophilia and inhibitors (antibodies) to coagulation factors VIII or IX. High circulating concentrations of FVIIa, achieved by exogenous administration, initiate hemostasis by combining with tissue factor at the site of injury, producing thrombin, activating platelets and coagulation factors II, IX and X, thus providing for the full thrombin burst that is essential for hemostasis. This “bypass” therapy has led some clinicians to use rFVIIa “off-label” for disorders of hemostasis other than hemophilia. Based on clinical experience, case reports and limited information from clinical trials, rFVIIa may be efficacious in states of decreased concentration of coagulation factors, thrombocytopenia, and at least some states of altered platelet function. 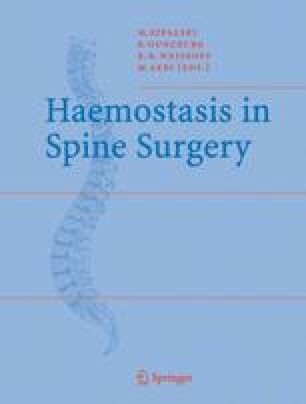 The former two can occur intra-operatively during spinal surgery as a consequence of substantial blood loss and normal consumption. Preliminary reports have indicated that rFVIIa does not increase the perioperative incidence of thromboembolic events. However, full reports from large clinical trials regarding the efficacy and safety of rFVIIa in settings other than hemophilia have yet to appear in peer-reviewed publications. Until adequate data demonstrating safety and efficacy are fully reported, it would seem appropriate to reserve the use of rFVIIa in spinal surgery to those instances where conventional therapy cannot provide adequate hemostasis, and “rescue” therapy is required.